One of the most famous comic duos in film history was Laurel and Hardy. The duo made over one hundred films, and for several decades their popularity was unrivalled. Starting in the last week of the summer holidays, the exhibition “Laurel and Hardy in Europe” can be seen in the Donaldson Institute in Noord-Scharwoude. Entry is free. From 1927 to 1955, the British Stan Laurel (1890 – 1965) and the American Oliver Hardy (1892 – 1957) were one of the most famous duos in film history. They entertained hundreds of millions with their slapstick films, first in the cinema and later on TV. The exhibition gives an impression of how their films were introduced and promoted in Europe. “Laurel and Hardy in Europe” is mainly composed of original material from three private collections. Particular attention is given to the Amstelveen film distributor, Express Film. After the war, right up to the late 1980s, the company made it possible for a number of Laurel and Hardy films to be shown in cinemas in the Netherlands. The duo Laurel and Hardy had many fans. The exhibition displays items from the first fan club and from the first European Laurel and Hardy convention in Paris in 1936. 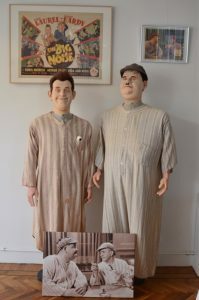 Included in the top pieces are two life-like Laurel and Hardy dolls, wearing pyjamas that were worn by Laurel and Hardy during the making of the film Big Noise (1944) and a unique poster from 1936 from the Laurel and Hardy compilation film ‘Hot Water’ or ‘In de penarie’, as it was known in the Netherlands. Other special items are signed portraits, correspondence, film posters, film photographs and merchandise in the form of one of the first salt and pepper sets of ‘the guys’. On a so-called viewing table, visitors can compare a flammable and inflammable version of a Laurel and Hardy film. The free Stan and Ollie exhibition in the Donaldson Institute is open from the last week of the summer holidays, Saturday 20th August. The exhibition “Laurel and Hardy in Europe” is open to visitors every Monday, Wednesday and Saturday from 14:00 to 17:00. Entry is free. The last day is Saturday, 20th January 2017. The exhibition can be visited by appointment at other times. The Geoffrey Donaldson Institute is located at Dorpsstraat 612 in Noord-Scharwoude. The institute is named after the Australian Geoffrey Donaldson, who lived in the Netherlands and was the first film historian of the Netherlands. The GDI is a private initiative and exists without government grants.